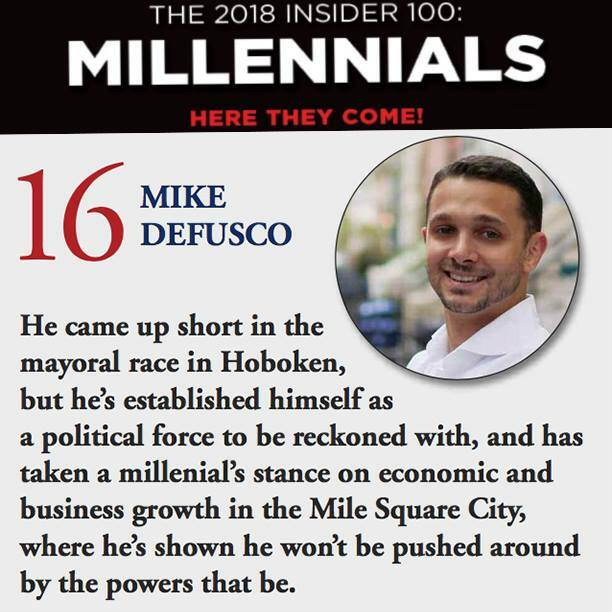 MSV: Councilman Mike DeFusco: "What's happening at Hoboken's future Hilton?" 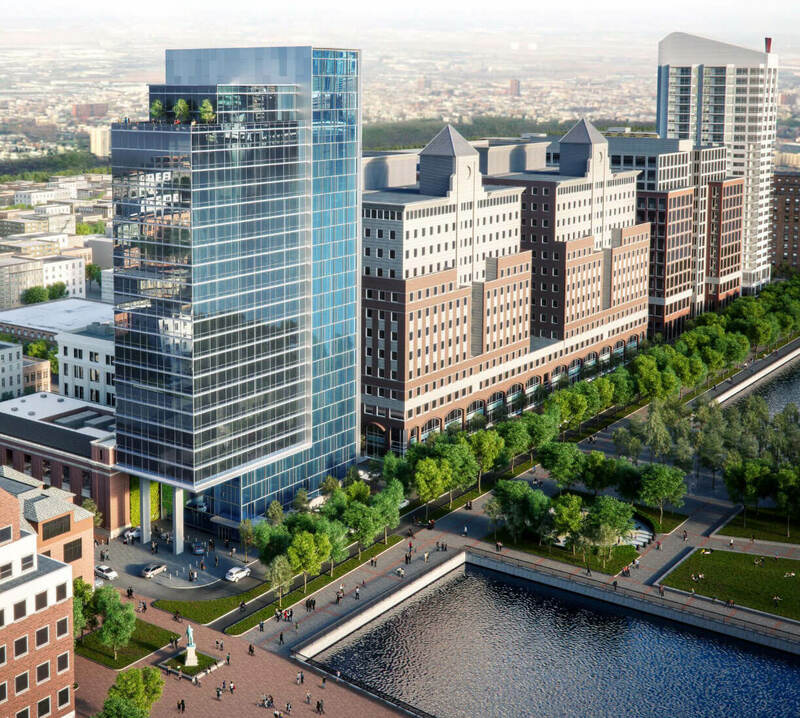 Councilman Mike DeFusco: "What's happening at Hoboken's future Hilton?" I have long advocated for a balanced hotel development in the parking lot behind the post office at 89 River Street, squarely within my home district, the first ward. This project’s ability to bring substantial yearly tax revenue (1.7mm) for the city, county and school district (400k), create jobs, support economic development, and add vibrancy to a downtrodden portion of the southern waterfront have long fueled my advocacy. Last week, the mayor presented the City Council Development Committee, which I co-Chair, with a revised plan to increase the size of the project to nearly 350 guest rooms. To put this in perspective, that’s larger than the redevelopment plan the City Council approved in 2017 which then Councilman-Bhalla said was “out of scale” and voted against. In exchange for this larger building, the mayor negotiated $3 million from the developer in the form of upfront capital for the City. Instead of using those funds to fund public projects, the mayor proposed donating the full amount to two local non-profits: the former uptown YMCA as well as HPEF - a group of parents supportive of our local district schools. I support those organization, but $3 million in developer givebacks simply wasn’t enough to justify the impacts of the overall project. So, I along with Council members Giattino, Fisher and Cunningham, as well as community advocates from affordable housing and public charters schools, got to work and pushed for additional financial givebacks to benefit a wider portion of the city. This resulted in the developer increasing their contribution an additional 50% to $4.5 million which funds $1 million for neighborhood infrastructure, 300k donation to our public charter schools and $200k for affordable housing. I am further pleased that just last night, the Council Commitee was able to secure a verbal commitment of an additional $350k — $184k for public charter schools and $166k for the first ward, to deal with the needs of the immediate neighborhood. This Council proposal would raise the overall potential giveback is $1.85mm over the mayor’s original agreement and provide parity to the public charter school donation while also further supporting the neighborhood being impacted. The mayor is aware of this updated proposal and we trust that he will be supportive. The biggest problem though is that the mayor missed a key opportunity to honestly invest in Hoboken's infrastructure as part of this project. It is difficult to square this decision with his heated rhetoric about our failing water mains, just a few short weeks ago. Though I'm pleased with the potential $1.16 million in infrastructure for the neighborhood, that amount doesn't come close to mitigating the overall impacts of nearly 350 new rooms on 1/2 a city block. 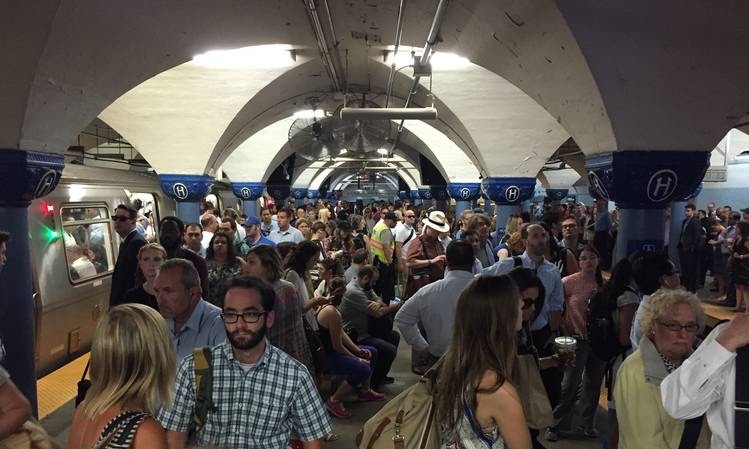 At a time when our city's failing infrastructure regularly make front page news, it’s critical that development deals like this one adequately support day-to-day quality of life for all Hoboken residents, like fixing our crumbling roads, replacing aging water-mains and modernizing parking and pedestrian safety. Lastly, in response to the public outcry from residents who felt this process wasn’t transparent, fair or in the case of our public charter schools, proportionate -- I agree. These funds were never publicly notified as being available, there was no process for applying and no way of fairly weighing their merits in a committee. The full Council will act to ensure that any future allocation of public funds for private purposes receive a significantly more thorough process. So long as the mayor agrees to the updated terms proposed by the Council, I am in support of moving this project forward on Wednesday. Court Street is one of the City's oldest streets, long in disrepair, but there’s something about it’s rough and faded glory that has always captured my imagination. When I first ran for Council, I started a conversation to invest in a historically sensitive rehabilitation of the lane and I’ve continued on that promise. After budgeting for it in 2017 and it getting voted down, I re-budgeted in 2018 and am excited that plans are moving forward. 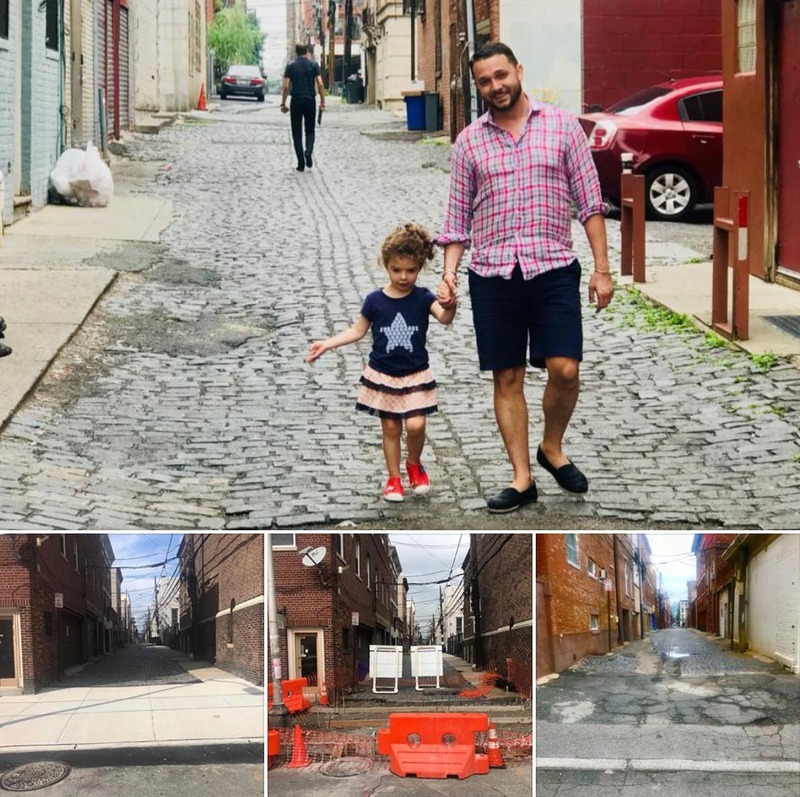 Just last month, the City hired an engineer to undertake a site survey and create a concept plan for the street’s historic rehabilitation and I had the pleasure of walking the street with them to discuss my potential vision. There will be two upcoming community meetings to get input and feedback, I will certainly make sure everyone is aware of scheduling. Lucy approves of the new sidewalk aprons and looks forward to seeing the upcoming concept plan to historically upgrade Court Street! I’m also pleased to report that within the 2018 budget I allocated adequate funding to replace the 12 sidewalks where 1st - 7th Streets intersect with Court Street. These overdue pedestrian additions were installed over the summer and now create a safer and more visually appealing walkway, for all. WHAT'S HAPPENING ON WASHINGTON STREET? Don’t shoot the messenger but the Washington Street project was supposed to be completed at the end of August, but is now delayed until next summer. To add insult to injury, the project is now $1,000,000 over budget and it’s barely half done. The contractor is pointing at the mayor saying the full scope of the project was never communicated, the mayor is pointing at the engineering firm, and the engineers are saying they told the City about issues with the contractor before the project even broke ground. 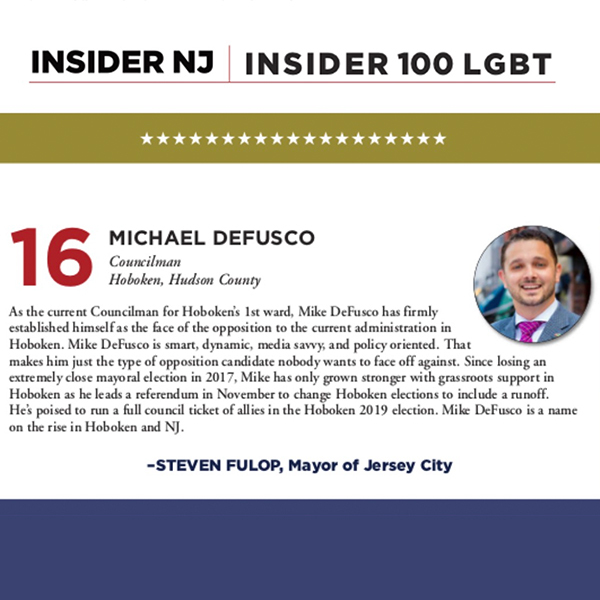 This kind of mismanagement could have been avoided and Hoboken deserves leadership that takes accountability and doesn’t point fingers. I recently voted on City Council to terminate the engineering firm because in spite of the obvious engineering errors, this is actually the same firm whose executive pleaded guilty to conspiracy to commit bribery, just last year. Cost overruns and delays only line the pockets of politicians and lawyers as residents and businesses suffer. I will continue to monitor the situation, but at this point my recommendation is to hold course and finish the project as quickly as possible. Any litigation will simply add more cost to an already exorbitantly expensive and mismanaged project. Over the past three City Council sessions, we have held back an attempt by the mayor to raise parking ticket prices anywhere from 25% - 50% as well as price hikes in City garages and at meters. Hoboken Parking Utility generated $18.5 million last year and $4.1 million of that was used to pad the municipal budget for non-transportation related purposes. Instead of using parking revenue to modernize our transportation infrastructure, the City seems to be using parking enforcement to fill budget gaps. Prohibit the city from ticketing cars within two minutes of a meter expiring -- an unfair practice that has been going on for too long. I will continue to stand up to a mayor who uses parking enforcement to fill gaps in the city budget while continuing a push to modernize our parking and transportation infrastructure, fairly. I cannot support any parking rate hikes without first seeing immediate upgrades to help motorists, cyclists, and pedestrians get around town. I’m not okay asking residents to pay more to park until we use technology and open sourced data to help ease the parking crunch. I look forward to working with the mayor to fund overdue transportation upgrades before passing parking rate hikes along to residents. I’m not under the impression that the Hoboken City Council can unilaterally instruct an independent inter-state agency on how to operate, but we’re trying and need your help! 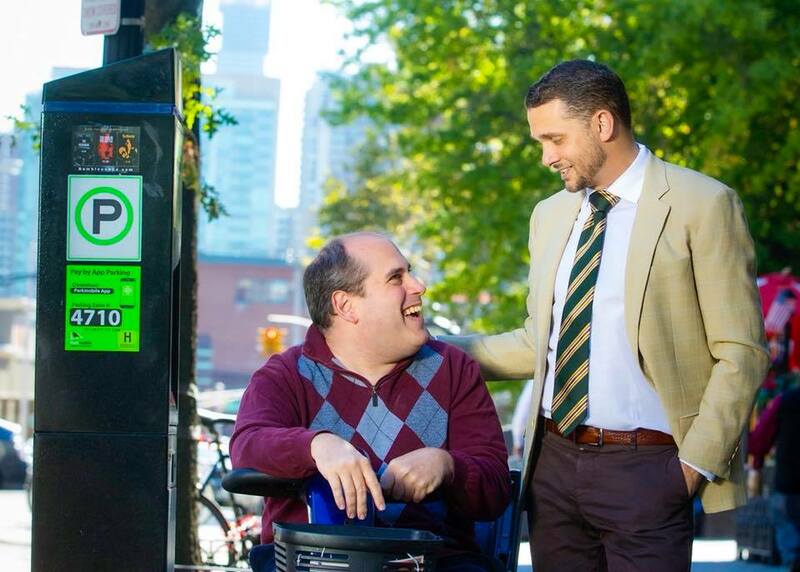 Please sign the petition to help push PATH forward and lend your voice to help improve the system, for everyone. ⛴ Utilizing small and mid-size passenger vans on established, publicly posted routes to transport ferry passengers from the West side of Hoboken to both ferry terminals in Hoboken. ⛴ Eliminating the fee for bikes to encourage bike ridership to the ferry. Recently, I wrote to you about how Hoboken taxpayers unknowingly spent nearly $20,000 to fund the defense of the mayor’s ethics violation, a case where he was reprimanded for voting on a business partner’s contract while a member of the City Council. In response, the City Council voted 7-2 to terminate the contract with the law firm retained by the administration to stop the taxpayer ripoff. However, by the time we found out and passed the resolution, the state had issued a settlement, saying that it remains firm in their belief that our mayor violated state ethics law. Specifically, "in the view of of the LFB (Local Finance Board), the conduct underlying is a violation of LGEL (Local Government Ethics Law)" however, due to the passage of time, the board moved to take no further action. So for the mayor to clear a $100 fine, he spent 20k in taxpayer funds but still wasn’t able to change the State's opinion that he violated ethics law. When I was first appointed to the zoning board at 28, I wouldn’t have imagined that I’d unseat a 21-year incumbent to join the City Council. If you told me that I would then run for mayor and lose by 400 votes against an entrenched politician, even under the most suspicious of circumstances, I would’ve said that’s the stuff of political thrillers. I am energized as ever to continue the fight for new energy and new ideas in Hoboken and ensuring that everyone has a voice! P.S. 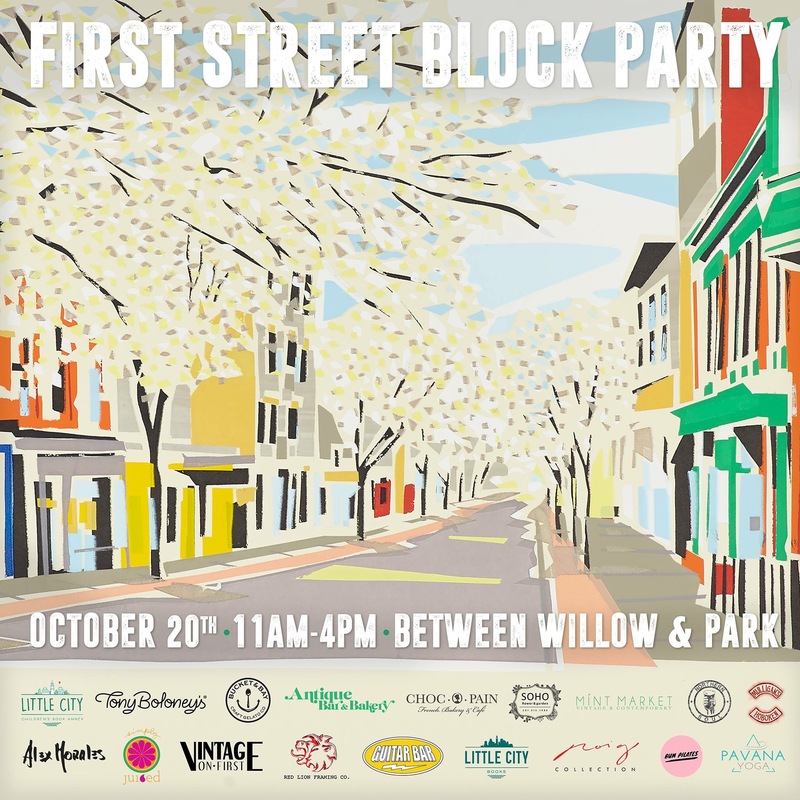 I'm happy to have worked to support 1st Street small businesses and bring the first ever "FIRST STREET BLOCK PARTY" to the first ward. This is the first step in bringing more activity and attention to my ward's commercial district and I hope you'll join us on Saturday October 20th, from 11a-4p and enjoy a terrific fall afternoon!